Human multiple myeloma (MM) cells require the supportive microenvironment of mesenchymal cells and extracellular matrix components for survival and proliferation. We established an in vivo chicken embryo model with engrafted human myeloma and mesenchymal cells to study effects of cancer drugs on tumor growth, invasion and angiogenesis. Martowicz, A., Kern, J., Gunsilius, E., Untergasser, G. Establishment of a Human Multiple Myeloma Xenograft Model in the Chicken to Study Tumor Growth, Invasion and Angiogenesis. J. Vis. Exp. (99), e52665, doi:10.3791/52665 (2015). Multiple myeloma (MM), a malignant plasma cell disease, remains incurable and novel drugs are required to improve the prognosis of patients. Due to the lack of the bone microenvironment and auto/paracrine growth factors human MM cells are difficult to cultivate. Therefore, there is an urgent need to establish proper in vitro and in vivo culture systems to study the action of novel therapeutics on human MM cells. Here we present a model to grow human multiple myeloma cells in a complex 3D environment in vitro and in vivo. MM cell lines OPM-2 and RPMI-8226 were transfected to express the transgene GFP and were cultivated in the presence of human mesenchymal cells and collagen type-I matrix as three-dimensional spheroids. 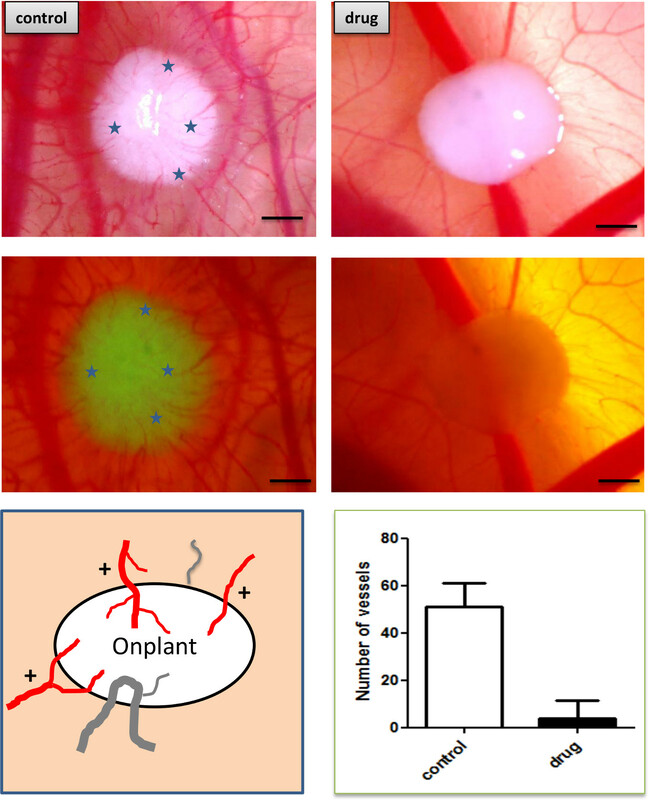 In addition, spheroids were grafted on the chorioallantoic membrane (CAM) of chicken embryos and tumor growth was monitored by stereo fluorescence microscopy. Both models allow the study of novel therapeutic drugs in a complex 3D environment and the quantification of the tumor cell mass after homogenization of grafts in a transgene-specific GFP-ELISA. Moreover, angiogenic responses of the host and invasion of tumor cells into the subjacent host tissue can be monitored daily by a stereo microscope and analyzed by immunohistochemical staining against human tumor cells (Ki-67, CD138, Vimentin) or host mural cells covering blood vessels (desmin/ASMA). In conclusion, the onplant system allows studying MM cell growth and angiogenesis in a complex 3D environment and enables screening for novel therapeutic compounds targeting survival and proliferation of MM cells. Multiple myeloma (MM) is characterized by proliferation of malignant plasma cells in the bone marrow, bone lesions and immunodeficiency 1. Although new treatment options such as proteasome inhibitors (bortezomib) and immune modulatory drugs (pomalidomide and lenalidomide) are available, MM still remains an incurable malignancy with a grim prognosis 2. The bad prognosis might be explained by the extraordinary heterogeneity of MM cell clones that contributes to variable responses to therapy, in particular under long time treatment and selection pressure of MM clones 3. Preclinical testing of new drugs and their combinations in vitro and in vivo is a critical and time-consuming step for future drug development. Thus, useful in-vivo models of MM are required to gain a better understanding of the biology of the disease and to enable the discovery of new drugs. Actually, the best xenotransplantation models for hematological malignancies and therapeutics are immune-deficient mice, such as the severe-combined immunodeficient (SCID) mice 4-7, the non-obese diabetic/SCID (NOD/SCID) mice 8,9 or the β-microglobulin-knockout NOD/SCID mice 10,11. Although murine models of human MM in some aspects can resemble the phenotype of human disease, immune-deficient mice are inbred, therefore simulate only one individual response to a drug and costs are very high. Due to immunosuppression animals require special maintenance conditions and the engraftment of human MM in mice requires 6 weeks to 2 months 9,12, unless cells are grafted directly to the bone marrow using a technically demanding procedure with lower rates of animal survival 7,13. Therefore, new methods using stem-cell based organoid models 14, tissue engineering 15 or sophisticated 3D cell culture models 16 have been established. They will compete in the near future with classical animal experiments for preclinical drug testing, but cannot replace systemic toxicity tests in living organisms. The chicken embryo has been demonstrated before to be a suitable organism for xenotransplantation of human cells and tissues due to lack of adaptive immune response until hatching 17-19. Moreover, each chicken embryo reflects an individual reaction to applied drugs or tumor cells due to genetic diversity within the chicken population. The chorioallantoic membrane (CAM) is a well-established system to study tumor-dependent angiogenesis 20-22. When solid tumors are grafted to the CAM, they display many characteristics of cancers in vivo, including proliferation, invasion, angiogenesis and metastasis 23-27. Based on the previous experience of our group with CAM xenograft models20,26,27, a human MM model was established that combines the advantage of a human 3D culture system with the model of ex ovo developing chicken embryos. This MM model system allows real time monitoring of MM growth progression, quantification of cell mass and preclinical drug testing. According to the Austrian law, and the Office of Laboratory Animal Welfare of the US public health service avian embryos are not considered as live vertebrate animals until hatching.The NIH Office of Laboratory Animal Welfare has provided written guidance in this area (http://www.grants.nih.gov/grants/olaw/references/ilar91.htm and NIH Publication No. : 06-4515). Culture MM cell lines OPM-2, RPMI-8226 and human mesenchymal stem cells from bone marrow in RPMI1640 medium, supplemented with 10% bovine fetal calf serum and 100 IU/ml penicillin, 100 μg/ml streptomycin and 2 mM glutamine in the presence of 5% CO2 at 37°C. Transfect 5 x 106 HEK 293FT cells with viral packaging mix (9 µg) DNA and 3 µg pLenti6/V5 dest eGFP vector by the use of 30 µl liposomal transfection reagent and transfection medium (10 ml). Remove transfection medium after 12 h and add 10 ml DMEM medium with 10% bovine calf serum and 1% non-essential amino acids (NEAA). After 5 days, collect supernatants of HEK293FT cells after centrifugation of swimming cells (1,000 x g, 5min). Determine viral titer by real time PCR as described elsewhere 28. Transfect 1 x 106 MM cells with eGFP lentiviral particles (1 x 105 particles) in a 24 well plate in complete growth medium. After 3 days, start selection process by adding 2 µg/ml blasticidin to the culture medium. For the commercially available eGFP lentivirus, use 500 µg/ml neomycin. After 2 weeks of selection, clusters of eGFP expressing MM cells will appear; collect cells by centrifugation (1,000 x g, 5 min) and expand them as OPM-2eGFP and RPMI-8226eGFP sublines for experiments (section 2 and 3). Chill collagen type-I solution and 10 x DMEM on ice. Mix 1/10 Volume of 10 x DMEM medium into collagen matrix; add NaOH (0.2 N) to neutralize acidic collagen solution to a pH value of 7.4; store collagen/medium solution on ice. Mix transgenic MM cell lines (OPM-2eGFP or RPMI-8226 eGFP; 250,000 per spheroid,) with human mesenchymal cells (50,000 cells/ spheroid, i.e., 30 µl drop). Centrifuge cell mixture in 15 ml tubes (1000 x g, 5min), add cold prepared collagen mixture (1mL) to the cell pellet and mix well (with 1,000 µl tip). Immediately pipette 30 µl of the collagen/cell mixture (with 100 µl tip) in a 24 well plate on sterile paraffin film and allow cell/collagen mixture to polymerize for 30 min at 37°C (see Figure 1A). Overlay MM spheroids with 1mL culture medium containing 1, 10 and 100 nM bortezomib (see Figure 1B). After 72 hr of incubation at 37°C, document spheroids by fluorescence stereomicroscopy (see Figure 1C). Transfer each spheroid by the use of forceps with wide flat jaws in a reaction tube for measurement of GFP (see Figure 1D). Incubate chicken eggs in a special incubator for avian eggs at 37°C and 70% humidity for three days. Thereafter, open eggs and transfer embryos to sterilized with ethanol, square, 10-cm plastic weighing boats with cell culture plate lid and incubate “ex ovo” for further six days, so that the CAM is able to develop (see Figure 2A). Chill collagen type-I solution and 10 x DMEM on ice, mix 1/10 Volume of 10 x DMEM medium into collagen matrix, Add NaOH (0.2 N) to neutralize acidic collagen solution to a pH value of 7.4; store collagen/medium solution on ice. Mix transgenic MM cell lines (OPM-2eGFP or RPMI-8226eGFP; 250,000 per spheroid,) with human mesenchymal cells (50,000 cells/ spheroid). Centrifuge cells in 15 ml tubes (1,000 x g, 5min; for each test compound 1 vial), add 1mL cold prepared collagen mixture with drug (at desired working concentration) to the cell pellet and mix well (with 1,000 µl tip). Place collagen drops (30 µl each) on parafilm in a 6 well pate for 30 min to allow polymerization of the extracellular matrix at 37°C. After 5 days of in vivo growth in an egg incubator at 37°C and 70% humidity, document xenografts by fluorescence stereomicroscopy (see Figure 2C). Euthanize chicken embryos by hypothermia at 4°C in the fridge for 5h. Remove xenografts with subjacent CAM tissue by an ophthalmic scissor and forceps with wide flat jaws. Use them for measurement of GFP (section 4, see Figure 2D) or for immunohistochemical analysis of blood vessels and/or invading tumor cells (section 5). Transfer each MM spheroid or excised xenograft into 0.5 ml RIPA Buffer containing 200 µg/ml protease inhibitors. Homogenize spheroid/xenograft with a tissue homogenizer on ice. Perform three freezing/thawing-cycles in liquid nitrogen and 37°C water bath. Centrifuge homogenate at 4°C for 20 min (12,000 g) and store supernatants. Dilute samples 1:20 in assay buffer (200 µl) of the ELISA kit. Measure GFP-levels by a commercial GFP ELISA Kit using biotinylated anti-GFP antibodies, according to the manufacturer’s protocol. Fix excised xenografts with CAM area in 4% paraformaldehyde O/N at 4°C. Place fixed xenografts into embedding cassettes and transfer them into a tissue embedding station with an increasing graded alcohol series (50%, 70%, 80%, 95% ethanol, xylol and paraffin; each step 60 min). Section xenografts (5 µm) by the use of a benchtop rotary microtome. Bake paraffin sections on glass slides O/N at 56°C. Deparaffinize sections by a decreasing graded alcohol series to double-distilled water (xylol, 95%, 80%, 70%, 50% ethanol, double-distilled water; each step 10 min). Perform antigen retrieval in a water bath (95°C, 20 min) with an antigen retrieval solution (citrate- buffer; pH 7.0; volume 100 µl). Block endogenous peroxidase activity with 100 µl 3% H2O2/methanol for 30 min. Block sections in PBS containing 10% fetal calf serum for 45 min (volume 100 µl). Stain for 1 hr with 100 µl of primary antibody (1µg/ml) diluted in PBS containing 1% fetal calf serum at RT. After washing 3-times in PBS, incubate for 1h with biotinylated secondary antibody (0.1 µg/ml) in PBS containing 1% fetal calf serum at RT. After washing 3-times in PBS perform color reaction by the avidin/biotin-complex (ABC) and the diaminobenzidine (DAB) substrate solution according to manufacturer’s instructions. 5.11. Stop reaction by transferring sections to double-distilled water, counterstain with hematoxylin and mount sections with a synthetic mounting medium. 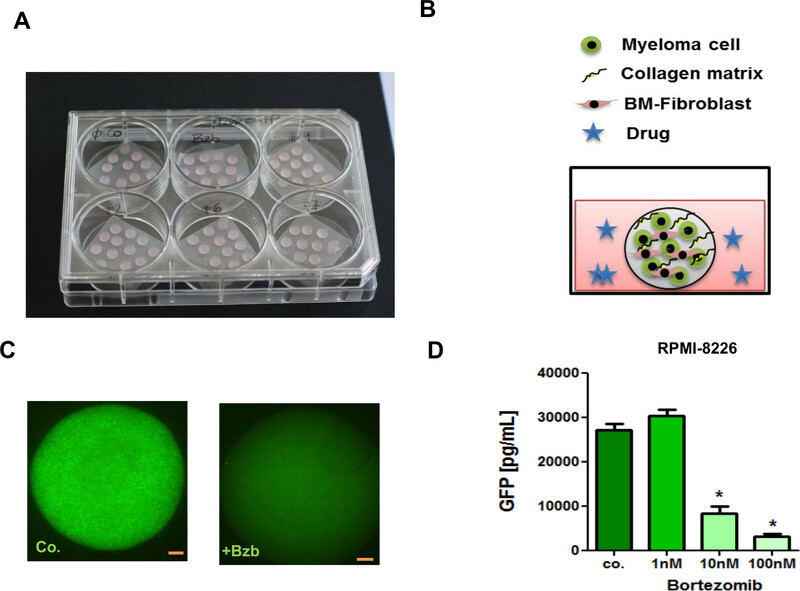 Due to the limitation of culturing primary human MM cells in vitro we established new 3D in vitro culture models for human MM cell lines making use of an extracellular growth matrix and supportive primary human mesenchymal cells from bone marrow (Figure 1A, B). EGFP transgenic MM cell lines allow visualization and quantification of MM tumor mass after 3D growth in spheroids. Both MM cell lines OPM-2eGFP and RPMI-8226eGFP were cultivated for 3 days in the presence of increasing concentrations (1- 100 nM) of bortezomib and tumors were visualized by the expression of GFP on a stereo fluorescence microscope (Figure 1C). Tumor cell mass was quantified after homogenization of spheroids and measuring eGFP contents by a GFP-ELISA (Figure 1D). Three day old chicken embryos were cultivated ex ovo for 6 days and at day 9 used for grafting of MM cells (Figure 2A). EGFP transgenic myeloma cells (OPM-2eGFP) together with human bone-marrow mesenchymal cells were embedded into collagen type-I as extracellular matrix component. The target substance bortezomib was applied topically at 1 nMol (Figure 2B). For each animal 4 “onplants” were grafted on the chorioallantoic membrane (CAM) of chicken embryos. After 5 days, MM xenografts formed tumors that could be visualized by the expression of eGFP. Compared to controls, bortezomib inhibited growth of MM cells in xenografts. Grafts displayed less green MM tumor cell mass (Figure 2C). Single MM xenografts from three different animals (n=12) were excised, homogenized and thereafter, measured by GFP ELISA. In direct comparison to controls bortezomib-treated xenografts had a significantly reduced myeloma cell mass (Figure 2D). Angiogenic responses around onplants can be observed by stereomicroscopy. Vascularization of xenografts was significantly reduced in drug-treated xenografts (1 nMol Plitidepsin, Figure 3). Angiogenic responses were quantified by counting blood vessels sprouting into onplant as described for the gelatin sponge assay by Ribatti et al. 21. For analysis of invasion, xenografts were excised with the adjacent CAM area. Xenografts were fixed, embedded in paraffin and sections prepared (Figure 4). Sections were stained with antibodies directed against ASMA/desmin to detect mural cells covering chicken blood vessels and with antibodies directed against human Ki-67, Vimentin and CD138 to detect proliferating and invading human tumor cells in chicken host tissue (Figure 4). Figure 1. 3D Multiple Myeloma Spheroids. (A) Generation of OPM-2eGFP and RPMI-8226eGFP spheroids with primary human bone-marrow mesenchymal cells and collagen type-I as extracellular matrix component. (B) Spheroids were incubated with culture medium and respective concentration of bortezomib (1- 100 nM). (C) MM spheroids were grown for 3 days and photographed by a stereo-fluorescence microscope. Bars indicate 500 µm. (D) Single spheroids were homogenized in lysis buffer and thereafter, measured in a GFP ELISA. GFP concentrations of single spheroids were calculated (n=5, Mean ± SEM). Stars indicate p values <0.05; Co. = control; Bzb = bortezomib. Please click here to view a larger version of this figure. Figure 2. Multiple Myeloma Xenograft Model. (A) On developmental day 9 ex-ovo chicken embryos were used for grafting experiments. (B) OPM-2eGFP and RPMI-8226eGFP were mixed with primary human bone-marrow mesenchymal cells, collagen type-I as extracellular matrix component and with 1 nM of bortezomib. After solidification spheroids (n=4) were grafted on the chorioallantoic membrane of chicken embryos. (C) After 5 days MM grafts in the CAM can be visualized by the expression of eGFP. Xenografts can be photographed daily by a stereo-fluorescence microscope. Bars indicate 500 µm. (D) Single MM xenografts were excised with subjacent CAM tissue, homogenized in lysis buffer and measured in a GFP ELISA. GFP concentrations of single tumors were calculated (n=12, Mean ± SEM). Stars indicate p values <0.05; Bzb = bortezomib. Please click here to view a larger version of this figure. Figure 3. Analysis of myeloma angiogenesis. MM xenografts (OPM-2eGFP) were documented five days after transplantation on the CAM of chicken embryos. In comparison to control grafts, treatment with plitidepsin (1nMol, n=10) resulted in superficially growing tumors that were less vascularized by CAM tissue. Blood vessels growing to the onplants (red) were counted as depicted in the graphical model of blood vessel types. Bars indicate 1 mm. Please click here to view a larger version of this figure. Figure 4. Analysis of myeloma cell invasion. Immunohistochemical analysis of MM xenografts (OPM-2eGFP) with subjacent CAM host tissue (bortezomib-treated versus controls). Proliferating human MM cells stain positive for Ki-67, CD138 and Vimentin and invade as cell clusters host tissue. Chicken blood vessels are stained with mural cell markers ASMA (larger vessels and arteries) and desmin (capillaries). Magnification 200x, asterisks indicate blood vessels of the CAM. Please click here to view a larger version of this figure. The development of new therapeutic agents for refractory MM requires less time consuming and expensive in-vivo systems to evaluate sensitivity of human MM cells to drugs. Hitherto, only few in-vivo systems are available for the preclinical evaluation of new anti-myeloma therapies. All of them have their limitations for large scale screening of compound libraries 29. The best current models for human MM cells are highly immune-deficient mice 7,13,30 and turkey embryos 29 . Both the SCID mouse and avian embryo xenograft models can be used to study the biology of MM and to test novel therapeutic compounds. However, murine systems have several limitations, including inbred genotype, technically demanding procedures, long observation periods and high costs. In this study, a novel 3D spheroid and avian xenograft model is presented for studying human MM cell biology that involves the presence of human mesenchymal stem cells and extracellular matrix as supportive components. MM cells strongly depend on their respective microenvironment, i.e. the presence of stroma-derived growth factors, cytokines and ECM components to survive and proliferate 31-33 . In addition, drugs might be inefficient or display altered activity when myeloma cells are protected by their local microenvironment 31,34 . In comparison to murine models, the described 3D in vitro and in vivo model systems are not expensive, rapid, and easy to handle. 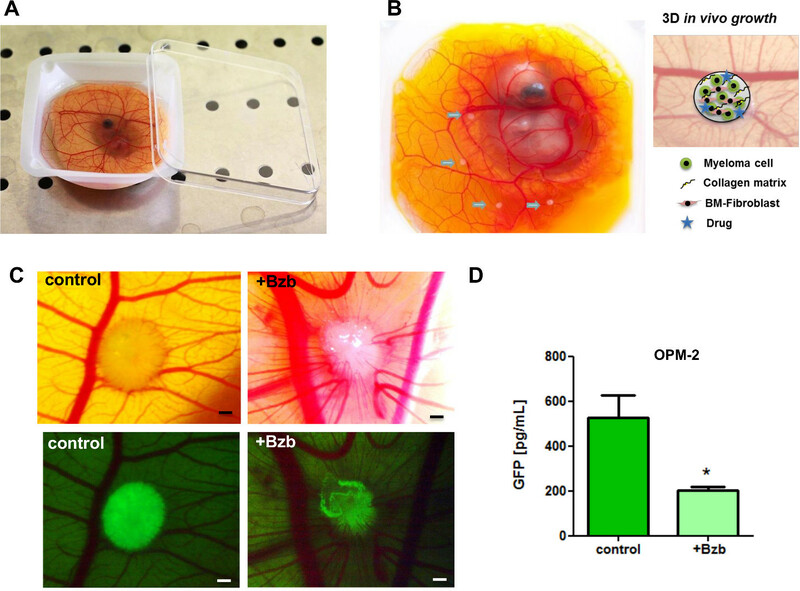 In addition, the transplantation of 3D MM spheroids to chicken embryos allows the analysis of myeloma-induced angiogenesis. A limitation of our system is the short time of MM cell growth and thus, analysis of metastasis to avian bones is not possible. A further limitation of our models is that we work with topical application of drugs in the CAM that might not reflect systemic applications and drug turnover/modification by liver enzymes. In addition, an approximately 50% survival rate until grafting was observed due to ex ovo growth conditions of chicken embryos. Regarding endothelial markers for IHC analysis, most markers used in human and mouse section to stain endothelial cells are not specific to blood vessels in chicken. Therefore, we recommend staining for the mural cell markers desmin/ASMA or the injection of lectins into chicken embryos 35 . Not all available human myeloma cell lines will grow invasively into chicken host tissue and display superficial growth. This will result in destroyed tissue after cutting sections on the microtome. Moreover, special care (selection antibiotics) should be taken that transfected cells do not lose the GFP transgene expression within time, due to permanent genetic rearrangements or DNA methylation processes. In conclusion, our chicken embryo xenograft model of human MM cells with stromal support provides a reproducible and predictable in-vivo model to study human MM cell growth and angiogenesis. This described MM model may facilitate faster in-vivo screening processes of anti-MM drugs, helping to reduce development time and costs for novel drugs. With further improving steps, such as bone-replacement material, complex ECM matrix and cytokines the system might be improved for testing therapeutics also against patient samples. This is a prerequisite for personalized cancer medicine and testing of drug sensitivity in individual refractory MM patients. The authors want to thank Ms. Cornelia Heis for her excellent technical assistance in immunohistochemistry and preparation of chicken embryos. This work was supported by the Austrian Science Fund (FWF Grant No. P19552) and the European Union (EU FP7 project Optatio No: 278570). SuperFrost Microscope Slides R. Langenbrinck Art.-Nr. DakoCytomation Wash Buffer 10x DakoCytomation Code-Nr. Target Retrieval Solution (10x) pH 6,1 DAKO Code-Nr. Kuehl, W. M., Bergsagel, P. L. Multiple myeloma: evolving genetic events and host interactions. Nat.Rev.Cancer. 2, (3), 175-187 (2002). Kumar, S. K., Gertz, M. A. Risk adapted therapy for multiple myeloma: back to basics. Leuk.Lymphoma. (2014). Prideaux, S. M., Conway, O. E., Chevassut, T. J. The genetic architecture of multiple myeloma. Adv.Hematol. 2014, 864058 (2014). Chauhan, D., et al. A novel orally active proteasome inhibitor ONX 0912 triggers in vitro and in vivo cytotoxicity in multiple myeloma. Blood. 116, (23), 4906-4915 (2010). Kuehl, W. M. Mouse models can predict cancer therapy. Blood. 120, (2), 238-240 (2012). Nefedova, Y., Gabrilovich, D. Mechanisms and clinical prospects of Notch inhibitors in the therapy of hematological malignancies. Drug Resist.Updat. 11, (6), 210-218 (2008). Yaccoby, S., Barlogie, B., Epstein, J. Primary myeloma cells growing in SCID-hu mice: a model for studying the biology and treatment of myeloma and its manifestations. Blood. 92, (8), 2908-2913 (1998). Dazzi, F., et al. Normal and chronic phase CML hematopoietic cells repopulate NOD/SCID bone marrow with different kinetics and cell lineage representation. Hematol.J. 1, (5), 307-315 (2000). Lock, R. B., et al. The nonobese diabetic/severe combined immunodeficient (NOD/SCID) mouse model of childhood acute lymphoblastic leukemia reveals intrinsic differences in biologic characteristics at diagnosis and relapse. Blood. 99, (11), 4100-4108 (2002). Feuring-Buske, M., et al. Improved engraftment of human acute myeloid leukemia progenitor cells in beta 2-microglobulin-deficient NOD/SCID mice and in NOD/SCID mice transgenic for human growth factors. Leukemia. 17, (4), 760-763 (2003). Li, M., et al. Combined inhibition of Notch signaling and Bcl-2/Bcl-xL results in synergistic antimyeloma effect. Mol.Cancer Ther. 9, (12), 3200-3209 (2010). Tassone, P., et al. A clinically relevant SCID-hu in vivo model of human multiple myeloma. Blood. 106, (2), 713-716 (2005). Ranga, A., Gjorevski, N., Lutolf, M. P. Drug discovery through stem cell-based organoid models. Adv.Drug Deliv.Rev. 69-70, 19-28 (2014). Pereira, R. F., Barrias, C. C., Granja, P. L., Bartolo, P. J. Advanced biofabrication strategies for skin regeneration and repair. Nanomedicine.(Lond). 8, (4), 603-621 (2013). Fischbach, C., et al. Engineering tumors with 3D scaffolds). Nat.Methods. 4, (10), 855-860 (2007). 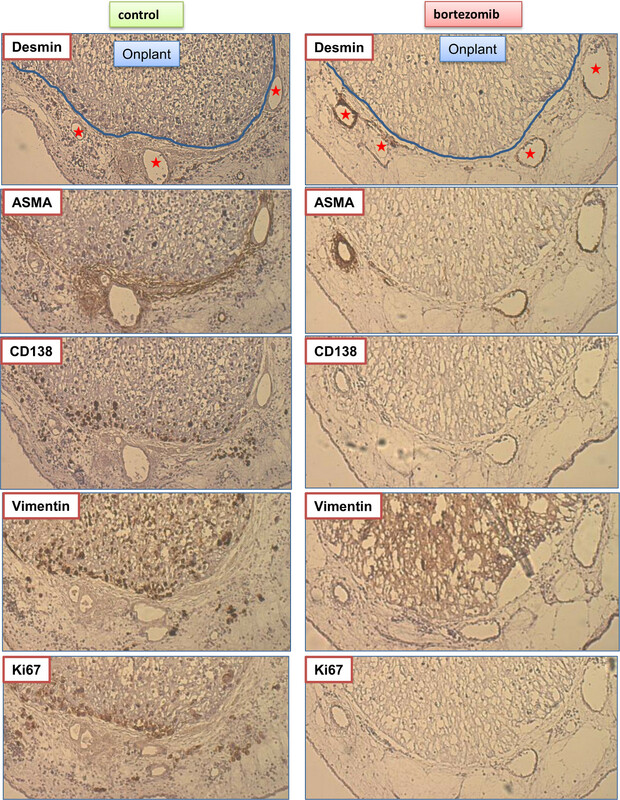 Boulland, J. L., Halasi, G., Kasumacic, N., Glover, J. C. Xenotransplantation of human stem cells into the chicken embryo. J.Vis.Exp. (41), (2010). Deryugina, E. I., Quigley, J. P. Chapter 2. Chick embryo chorioallantoic membrane models to quantify angiogenesis induced by inflammatory and tumor cells or purified effector molecules. Methods Enzymol. 444, 21-41 (2008). Deryugina, E. I., Quigley, J. P. Chick embryo chorioallantoic membrane model systems to study and visualize human tumor cell metastasis. Histochem.Cell Biol. 130, (6), 1119-1130 (2008). Kern, J., et al. GRP-78 secreted by tumor cells blocks the antiangiogenic activity of bortezomib. Blood. 114, (18), 3960-3967 (2009). Ribatti, D., Nico, B., Vacca, A., Presta, M. The gelatin sponge-chorioallantoic membrane assay. Nat.Protoc. 1, (1), 85-91 (2006). Ribatti, D. The chick embryo chorioallantoic membrane as a model for tumor biology. Exp.Cell Res. (2014). Dohle, D. S., et al. Chick ex ovo culture and ex ovo CAM assay: how it really works. J.Vis.Exp. (33), (2009). Kobayashi, T., et al. A chick embryo model for metastatic human prostate cancer. Eur.Urol. 34, (2), 154-160 (1998). Koop, S., et al. Fate of melanoma cells entering the microcirculation: over 80% survive and extravasate. Cancer Res. 55, (12), 2520-2523 (1995). Martowicz, A., Spizzo, G., Gastl, G., Untergasser, G. Phenotype-dependent effects of EpCAM expression on growth and invasion of human breast cancer cell lines. BMC.Cancer. 12, 501 (2012). Martowicz, A., et al. EpCAM overexpression prolongs proliferative capacity of primary human breast epithelial cells and supports hyperplastic growth. Mol.Cancer. 12, 56 (2013). Geraerts, M., Willems, S., Baekelandt, V., Debyser, Z., Gijsbers, R. Comparison of lentiviral vector titration methods. 6, 34 (2006). Farnoushi, Y., et al. Rapid in vivo testing of drug response in multiple myeloma made possible by xenograft to turkey embryos. Br.J.Cancer. 105, (11), 1708-1718 (2011). Wunderlich, M., Krejci, O., Wei, J., Mulloy, J. C. Human CD34+ cells expressing the inv(16) fusion protein exhibit a myelomonocytic phenotype with greatly enhanced proliferative ability. Blood. 108, (5), 1690-1697 (2006). Hideshima, T., Mitsiades, C., Tonon, G., Richardson, P. G., Anderson, K. C. Understanding multiple myeloma pathogenesis in the bone marrow to identify new therapeutic targets. Nat.Rev.Cancer. 7, (8), 585-598 (2007). Parikh, M. R., Belch, A. R., Pilarski, L. M., Kirshner, J. A three-dimensional tissue culture model to study primary human bone marrow and its malignancies. J.Vis.Exp. (85), (2014). Schuler, J., Ewerth, D., Waldschmidt, J., Wasch, R., Engelhardt, M. Preclinical models of multiple myeloma: a critical appraisal. Expert.Opin.Biol.Ther. 13, Suppl 1. S111-S123 (2013). Kirshner, J., et al. A unique three-dimensional model for evaluating the impact of therapy on multiple myeloma. Blood. 112, (7), 2935-2945 (2008). Jilani, S. M., et al. Selective binding of lectins to embryonic chicken vasculature. J.Histochem.Cytochem. 51, (5), 597-604 (2003).